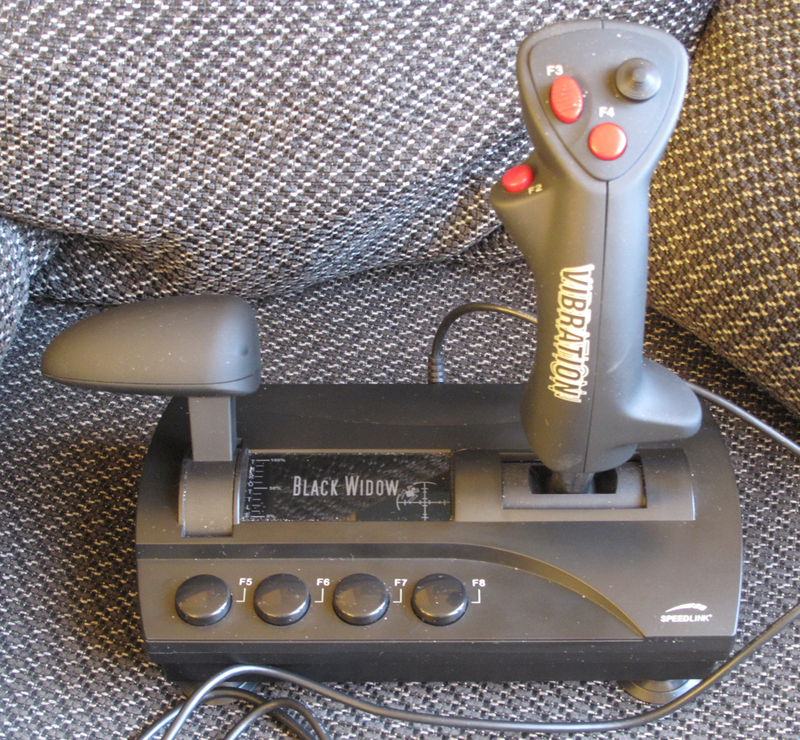 Obviously, this is a bit more sophisticated than the controller with small joysticks which I used for the StyloSim, and the kind of thing used for semi-realistic flight control programs, having a throttle on the left-hand side and joystick on the right, and a nice feel to it. As for musical applications, it connects to a computer via USB, as can be seen in the photo, so is very suitable for use with PureData’s ‘hid’ (Human Interface Device) function. 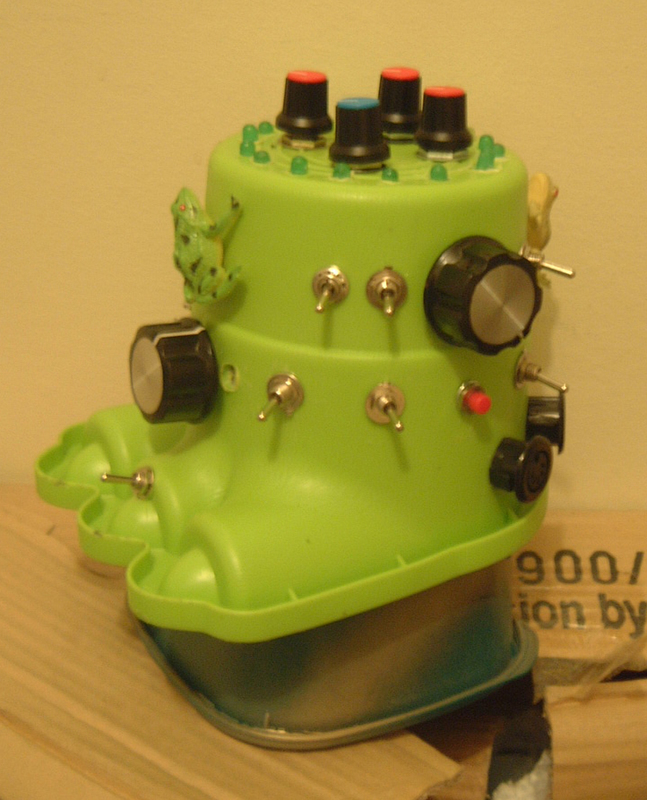 I thought at first of designing an instrument, but felt this would be less easy to operate than the Cybersynth or Theresynth, which used gamepad-type controllers. An effects device like the StyloSim would be possible, but at the moment would seem like going over old ground: something I might come back to later. Instead, I decided on a device for manipulating samples. At the time I thought this was an original idea, but I have subsequently discovered someone who does this – in quite a different way, but using the same kind of device: http://www.youtube.com/watch?v=9wdb6-QLnQ0. That was Johannes Kreidler, a very interesting contemporary German composer making music with cutting edge electronics. Check out his website at http://www.kreidler-net.de/english/index.html or type ‘Johannes Kreidler’ into YouTube. Kreidler is also an expert on PureData, as it happens, and wrote the very good tutorial ‘Programming Electronic Music in Pd’, translated into English at http://www.pd-tutorial.com/english/index.html. 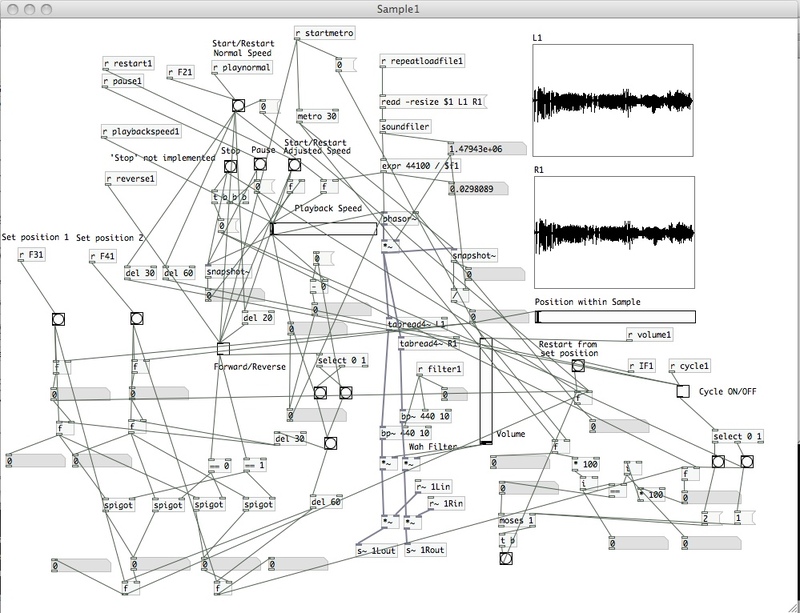 So, I used PureData to create a simple device for manipulating samples with the Black Widow. 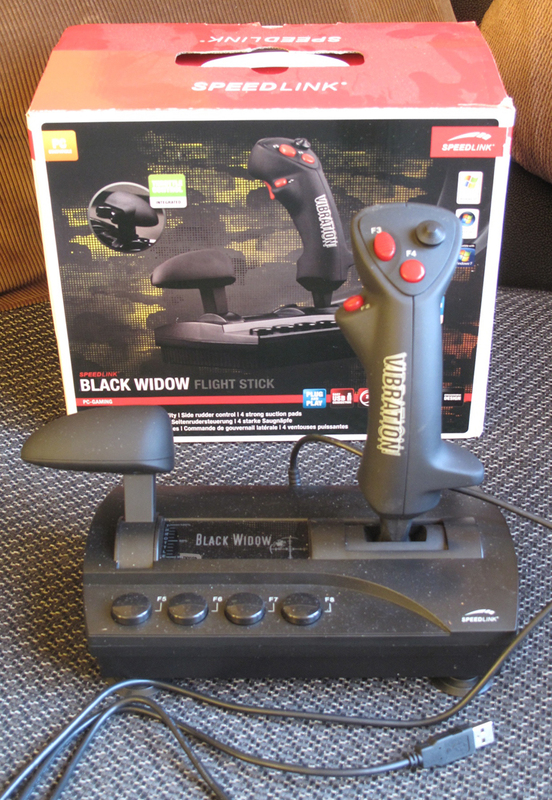 These are used to control up to 4 separate samples: when the Black Widow Pd app is first opened, the buttons are pressed one by one to load the 4 samples; when in use, the throttle, joystick and other controls operate on the sample whose button was last pressed. Pressing the left-hand button on the back of the throttle and moving the throttle forward from the central position increases the sample playback speed; moving the throttle backwards from the central position increases the playback speed, but plays the sample backwards. When the button is released the speed and direction are fixed. Pressing the right-hand button on the back of the throttle toggles the playback direction. Moving the joystick to the left pans the sample to the left; moving it to the right pans it to the right. 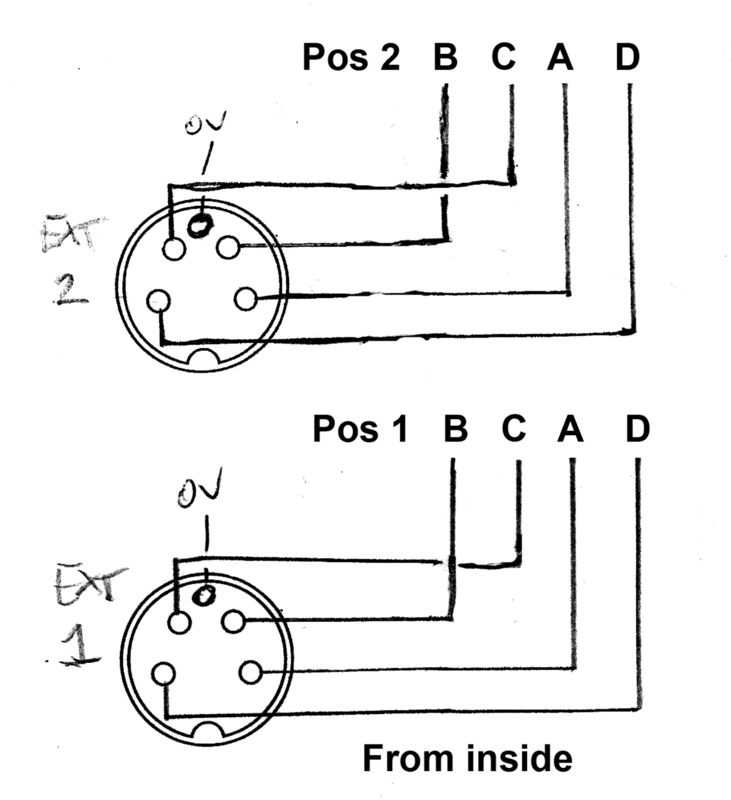 Moving the joystick forward from the central position increases the playback volume; moving it backwards from the central position increases the centre frequency of a bandpass filter. The button F3, when pressed as the sample is playing, sets the start point of a section within the sample; F4 sets the end point. The hatswitch has 4 functions: RIGHT cycles playback from the start point to the end point of a section set with the F3 and F4 buttons; DOWN pauses playback; UP Restarts playback; LEFT fixes a volume or filter setting. F2 restarts playback at normal speed from the beginning of the sample. There are some problems with it: it doesn’t always seem to respond to instructions, particularly the ‘Fix’ command from the hatswitch, don’t quite know why. Also, the interface isn’t very practical: if you want to look at what you’re doing as well as listen, there are separate windows for each sample which you have to bring to the front. However, it mostly works as described, and is quite entertaining to play with! I’ll post a sound file shortly. [Edit: the Black Widow has been superseded by the Black Widow, MkII, described here]. 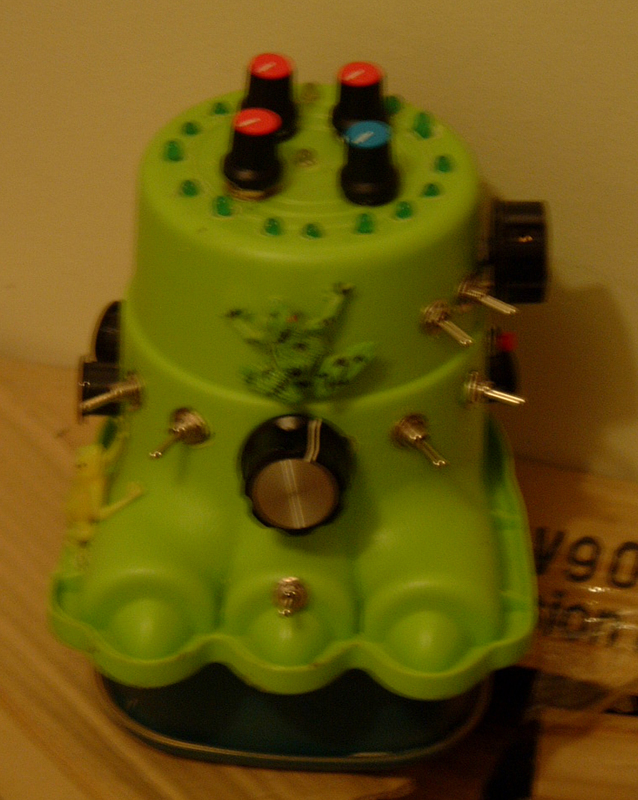 As described in Bigfoot, Part 1, I was constructing a device to play a modified stylophone remotely and automatically. Using a 16 way analogue switch, the 24-pin 4067 chip, I designed a device where any one of 15 intervals on a 2-octave tonic sol-fa scale would be triggered by changing the chip’s 4-bit binary input. First of all, I had used a physical control, a 16 position binary or hexadecimal rotary controller; what I needed next to find was chips that could be made to output sequences of 4-bit binary numbers. There are several of these, and I went for the 4516, which is a pre-settable binary counter. It can, if left alone, repeatedly count upwards from 0 – 15, outputting numbers in binary form (‘0 0 0 0’ to ‘1 1 1 1’) on the pins marked ‘Q1’ to ‘Q4’ in the diagram below at the speed of a pulse connected to its clock input (Pin 15); or downwards from 15 – 0. But by pre-setting a certain number, in binary form, on 4 extra binary inputs, marked ‘P1’ – ‘P4’ in the diagram, it can also be made to count upwards from this number to 15; or downwards from this number to 0. Q1 – Q4, as mentioned above, are the outputs, and P1 – P4 are the inputs for the number the count starts from, both in the form of a binary number. The ‘Preset Enable’, pin 1, is usually held low (0v): when it’s taken high (+v) the number on the inputs P1 – P4 is loaded in and the next count starts from that number. ‘Preset Enable’ is sometimes referred to as ‘Load’ for this reason. The ‘Carry Out’ is normally high, but goes low when the count ends. The ability to count downwards from a set number would be useful for an arpeggiator, which could be set to repeat a sequence with a length of 2 – 16 notes, using the rotary encoder, described in Part 1, connected to the 4 binary inputs to preset the sequence length. The circuit for this device was extremely simple, requiring only the rotary encoder, a momentary switch to tell the 4516 to load the sequence length number, an on/off switch and two inverters from a 40106 (which has 6 in it altogether) . One of the inverters was connected as an oscillator, which was connected to the 4516’s Clock input: this determines the speed at which notes sound; the other inverter was connected between the ‘Carry Out’ and ‘Preset Enable’ pins: the ‘Carry Out’ is normally high, so the inverter keeps the ‘Preset Enable’ low; when the count ends the ‘Carry Out’ goes low and the inverter sends a ‘high’ pulse to the Preset Enable, reloading the start number. 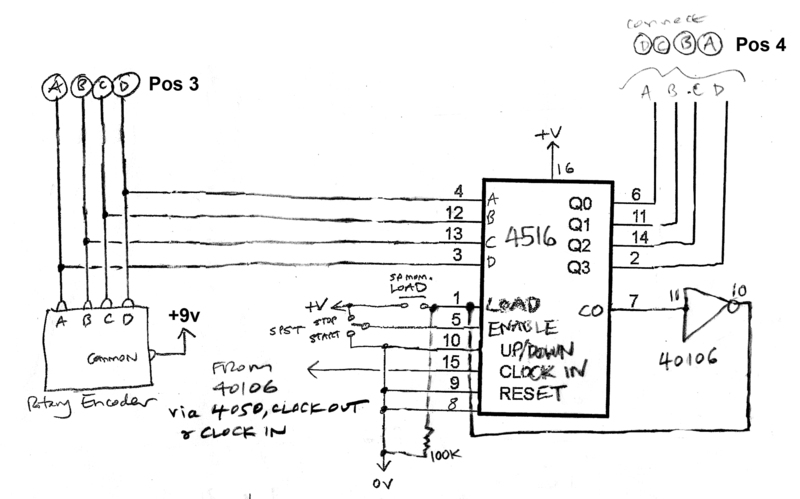 Pin 10 is connected to 0v in this circuit, which tells the 4516 to count down, not up: this was the easiest way to make sure it counted the right number of notes in the sequence. In fact, counting up or down would result only in a scale or part of a scale being played, so I made the output a bit more interesting by reversing the 4 outputs. Instead of connecting the A output of the 4516 to the A input of the 4067, the B output to the B input, etc., I connected it so that A B C D were connected D C B A. In essence this meant that consecutive notes in the sequence would not be consecutive notes in the scale, which I thought would be more interesting. This produced method 2 of controlling the Stylophone: automatic arpeggiation. The third method of controlling the Stylophone automatically used 3 more of the inverters in the 40106 which had been used for the 4516 clock and ‘Carry Out’ inverter. The inverters were wired as oscillators. This was the idea that came from the ‘Slacker Melody Generator’, described at http://electro-music.com/forum/viewtopic.php?t=27239&postorder=asc&start=50. Each of the 4 oscillators is connected to one of the 4 inputs of the 4067; each runs at a different speed, changing the value on that input from low to high, or 0 to 1. The different successive combinations of 0s and 1s produces a random melody, which can be changed by adjusting the speed of the oscillators, increasing or decreasing the rate at which each particular input changes from ‘1’ to ‘0’. The reason the four oscillators have two capacitors each is simply because the original circuit I used suggested values of 220n; I soldered these in place, but the oscillators seemed to run too fast for my liking, and it was easier to add new ones in parallel than take the old ones out and replace them. The result of putting capacitors in parallel is the opposite of putting resistors in parallel – instead of the overall value decreasing, it increases; the capacitance is larger and the oscillators run slower. Having put the 4067 and the five DPDT switches in place, I then had to connect the relevant input/outputs to 24 different resistors, in a chain (or ladder) like the original one inside the stylophone. I suppose it would have been possible to calculate the exact resistances, but I had some time ago obtained a hundred 10k presets for about 7p each, for exactly this kind of situation, so decided to use those and tune it by ear. This took some time, but at the end of it I had a substitute resistor chain for the SoftPot Stylophone and some methods of controlling it automatically. It then occurred to me that with this arrangement, all this extravagance could only control one stylophone at a time, so I had a think about how to connect more instruments (and possibly instruments other than stylophones!). The way to do it, it seemed to me, was to use the binary inputs to the 4067 as an output: any device could then be controlled, just by installing the 4067 and the five ‘major/minor’ switches in it – or perhaps some other suitable arrangement. So I added two 5-pin DIN sockets as outputs, the five terminals being A, B, C, D and 0v. Each of the four A, B, C, D outputs was buffered, using four of the six buffers in a 4050. The 4050 is similar to its sister chip, the more well-known 4049; but whereas the 4049 inverts its outputs, the 4050 doesn’t. This chip has even cleverer properties, which I will be using in a later project, but here I used it to ensure the binary outputs were of sufficient strength to make their way through a connecting cable and satisfactorily operate external circuitry. I also added at this stage Clock In and Clock Out sockets, which would enable Bigfoot to set the tempo of a piece involving different instruments, or follow the tempo set elsewhere. These two input/outputs passed through the remaining two buffers on the 4050. The final thing was to add two more 5-pin DIN sockets, this time as inputs. This would enable external circuitry to control the 4067s. I had several more ideas of suitable external devices which could be used to do this, and I hope to be able to get around to making these quite soon. The only other unusual component needed to get all this to work was a suitable master switch, to select the various external and internal inputs to the 4067s. This had to have 4 poles – the A, B, C, D binary inputs – and 5 positions. 4 pole, 3 way rotary switches are easy to come by, but 4 pole, 4 or 5 way are not. Fortunately, I was able to source a 4 pole, 5 way switch on eBay from a supplier in Hong Kong for just a couple of quid, so everything was in place. With a circuit like this – just a handful of chips and a few external components – you either get a neatly laid out PCB or a rats’ nest of wiring. I ended up with a rats’ nest of wiring . . . however, it worked, even when crammed into the case, with the addition of an extra section underneath the ‘big foot’ I had selected. This picture shows the two binary input sockets on the left. The 5 way switch is the knob on the front of the Bigfoot, just the right of centre in this picture. Due to a certain amount of experimentation along the way, some changes of mind about the functions, and some difficulties in getting all the switches and sockets to fit, there were some extraneous holes which I had drilled in the case. 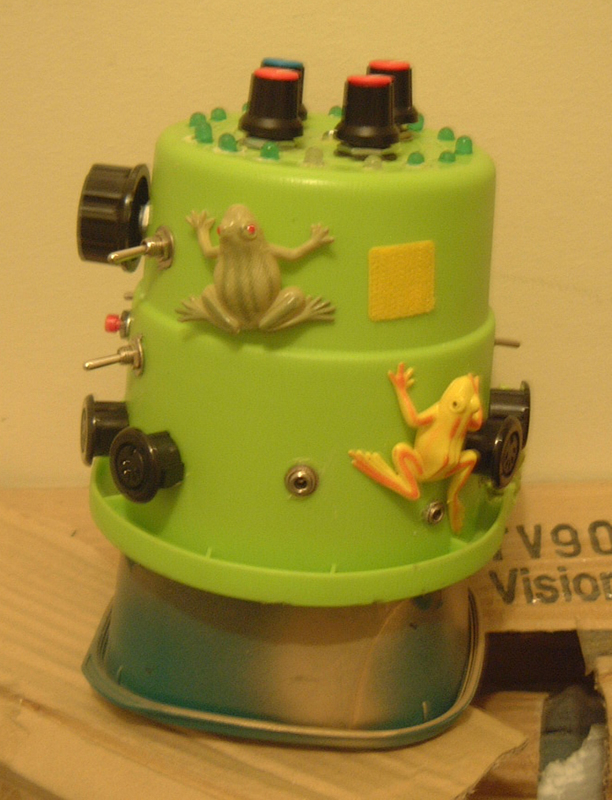 The plastic frogs are there to hide the holes. I also added a square of velcro on the back where I could attach a battery holder, as I had done with a number of previous projects. [Edit: there is now a link to a short video of the Bigfoot in action at the bottom of this page]. I’d made enough instruments for the time being, and it was time to construct some automatic controllers – sequencers, arpeggiators and the like – as an alternative to playing them by hand. I got the inspiration from several places: the arpeggiator and sequencer from Fun with Sea-Moss: http://milkcrate.com.au/_other/sea-moss/; the melodygenerator by Slacker described on the electro-music.com forum: http://electro-music.com/forum/viewtopic.php?t=27239&postorder=asc&start=50; and the Intro to Lunetta Synths at https://docs.google.com/document/edit?id=1V9qerry_PsXTZqt_UDx7C-wcuMe_6_gyy6M_MyAgQoA&pli=1, All these sites are full of great ideas and practical examples. The way it works is like this: it’s an analogue switch, not a digital switch, meaning you can connect anything you like to the pole (pin 3, marked Z in the diagram) and the 8 switch input/outputs (on the right-hand side, marked Y0 – Y7). It doesn’t have to be logic high or logic low (i.e. +v or 0v) , it can be any voltage, an audio signal, anything – just like a physical switch. Any one of the 8 input/outputs can be connected – one at a time – to the pole, not by turning a physical switch, but by the logic high or logic low status of the 3 ‘Select’ inputs (pins 9, 10 and 11, marked S1 – S3). You can have every combination of logic high and logic low on the three Select inputs, ranging from 0v on all of them, 0v on one of the three and +v on two of them, +v on two of them and 0v on one, or +v on all of them. There are eight possible variations, starting with 0v on all of them, which you could represent as ‘0 0 0’ or the binary equivalent of the number zero, to +v on all them, which could be represented as ‘1 1 1’ or the binary equivalent of the number 7. If you feed 0v to all three of the Select inputs, or ‘0 0 0’, this is lowest possible binary number, so the lowest or first input/output is connected to the pole (Y0, pin 13); if you connect, say the one on pin 9 (S3) to +v and the other two to 0v, this would be the binary number ‘1 0 0’, the equivalent of the number 4. Because the sequence starts with ‘0 0 0’ , or zero, feeding in ‘1 0 0’ connects the 5th rather than 4th input/output to the pole (Y4, pin 1). By connecting all the Select inputs to +v, or ‘1 1 1’ (the number 7), the 8th input/output is connected to the pole (Y7, pin 4). In the circuits I looked at, a common type of connection would be to have the pole connected to the part of an oscillator circuit that determines the pitch, and 8 input/outputs connected to different value resistors. This would mean that a different resistance would be connected to the oscillator and a different pitch would be sounded when each of the 8 input/outputs was connected to the pole. You could determine whether each of the Select inputs was a ‘1’ or a ‘0’ with three 2 way switches, +v one way, 0v the other way, and change the notes by moving different switches up and down. But this would be rather tedious. By adding a circuit that automatically changed the ‘1’s and ‘0’s, you have a melody generator, arpeggiator or sequencer. This was the kind of circuit I was after. However, 8 notes was bit restricted. Not restricted because there are 12 notes in one octave, though: I reasoned that you could make life easier for yourself by only allowing notes in a single scale – the ‘do’, ‘re’, ‘mi’ approach so succinctly captured in the Rodgers and Hammerstein song from The Sound of Music (‘Do a deer, a female deer/Re, a drop of golden sun’, etc.). There are only 8 notes in a ‘do’, ‘re’, ‘mi’ scale, including the next ‘do’ up from the one you started from. If you just use those, you’ll never get an ‘out of tune’ note in your arpeggio or sequence. (Why this public domain picture is held by Music Department of the Bibliothèque National de France is not adequately explained by the Wikipedia, where I found it. I suppose the fame of ‘do’, ‘re’, ‘mi’ is international). No, it was restricted instead because the SoftPot Stylophone has 12 ‘do’, ‘re’, ‘mi’ steps from the bottom of the keyboard to the top – and in any case could be made to produce notes outside the range of the built-in keyboard. So I decided I needed 16 steps (2 octaves, including ‘do’ two octaves up from the start), and found a chip, the 4067, to do the job. 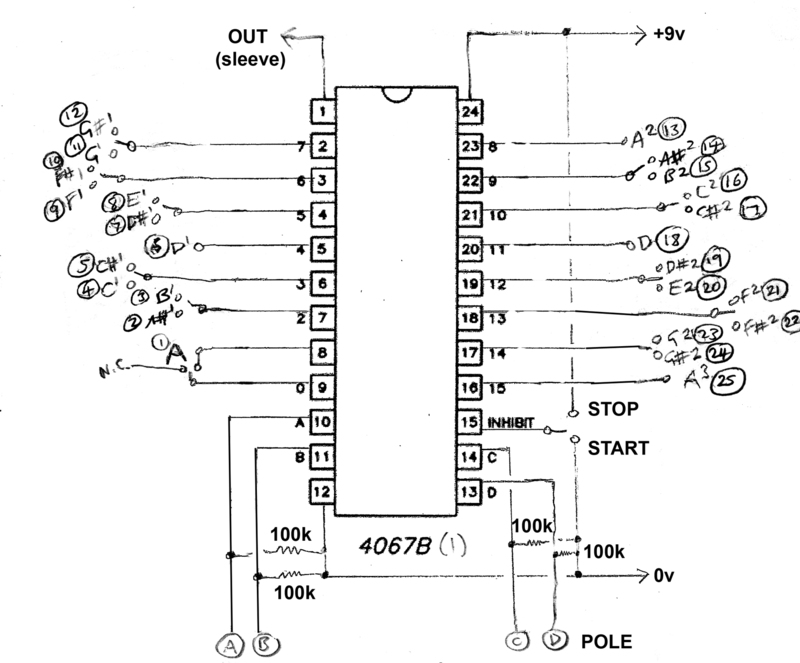 The 4067 is a single-pole switch like the 4051, but with 16 switches instead of 8. The only way it differs in operation from the 4051 is that it requires 4 Select inputs in order to go all the way from ‘0 0 0 0’ (zero, meaning the first input/output is connected) to ‘1 1 1 1’ (15, meaning the 16th input/output is connected). It’s very similar to the 4051: there’s a Pole (pin 1, marked Z); 16, instead of 8, input/outputs (right-hand side, marked Y0 – Y15); and 4, instead of 3, Select inputs (pins 10. 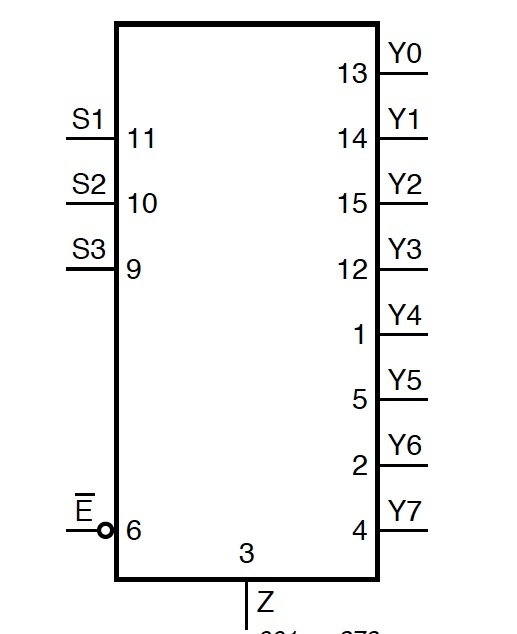 11, 13 and 14, marked S0 – S3). I also decided to make things slightly more complicated by considering alternative scales. If you follow the ‘do’, ‘re’, ‘mi’ scale of the Rogers and Hammerstein song, this is a major scale. If, on the other hand, you wanted to play, for example, a minor scale, you would find that ‘mi’, sometimes ‘la’ and sometimes ‘ti’ have to be changed to be a semitone lower. And occasionally you might feel like making ‘re’ and ‘so’ lower as well. (‘Do’ and ‘fa’ can be left alone!). 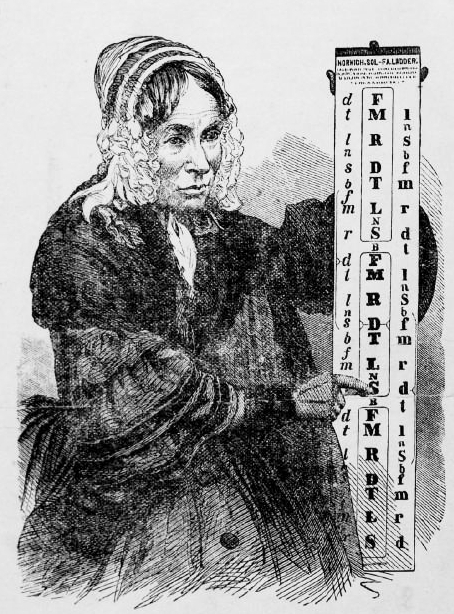 The notes depicted are the notes that would be used in the key of A. Since the SoftPot Stylophone has a tuning control (in fact two tuning controls!) on it, it can be made to play in any key, not just A; the circuit here doesn’t need to be changed, only the tuning on the SoftPot Stylophone itself. Each of the 16 outputs of the 4067 is connected to a resistor in a chain. The top of the chain is connected to the tip of a 3 way (‘stereo’) 3.5mm socket; the bottom of the chain is connected to the ring, and the sleeve is connected to pin 1 of the 4067 – the pole of the 16-way switch. When plugged in, it takes the place of the Stylophone’s own resistor chain. Note that switches allow you to choose between 1) major and minor 2nd (‘re’); 2) major and minor 3rd (‘mi’); 3) major and minor 5th (‘so’); 4) major and minor 6th (‘la’); and 5) major and minor 7th (‘ti’), as you see fit. C1/C#1 and C2/C#2, D#1/E1 and D#2/E2 etc. use the same switch, so there are 5 of these switches, not 10. The reason I chose to do it this way is because of an extremely interesting article – series of articles, actually – which I read on The Tonal Centre website, written by Andrew Milne. I’m not in the slightest bit concerned that the theory described there is ‘unconventional and some of the concepts . . . quite novel’, as it seems to me to make perfect sense, and presents a coherent view of scales and chords which I’ve found quite easy to understand, and useful to use. Furthermore, Milne’s motives for writing the articles are ones with which I would hope none of my readers could disagree: ‘not for theory to be an intellectual straight-jacket which smothers spontaneity, but as a springboard for creativity and, even more importantly, as a foundation for exploration’. 1. What constitutes a useful and versatile scale? A scale should constitute ‘a unified collection of notes – a selection which is in some sense complete and to which any addition is heard to be extraneous’. 2. What makes a scale useful as a melodic resource? A scale should be ‘reasonably smooth and even, without sudden gaps which sound as if a note has been omitted, or sudden concentrations of notes which sound as if an extraneous note has been added’. 3. What makes a scale useful as a harmonic resource? Because three-note major and minor chords are the basis of our kind of western music (like C-E-G and C-Eb-G), a scale shouldn’t have any notes which aren’t part of a three-note major or minor chord. Of all possible scales there are only five prime scales which satisfy Milne’s criteria, as above. (These are the main criteria, but see the full article for a couple of others). All of these scales contain, as it happens, seven notes, and these are clearly the most useful and versatile scales to use. This was good news for me, as the Bigfoot would inevitably use 7-note scales. So, there are 8 different scales you can use, which all allow you to make interesting melodies and chords. Each one has its own ‘character’, and some are much more commonly used than others. This series of articles seemed to me when I came across it to be an extremely good guide to useful scales, and could be a help to anyone: you could use the description above to work out what scale or scales you commonly use, and then try writing a composition or improvising a solo using a completely different one. There’s bound to be at least one you’ve never thought of using before! Bigfoot allows the 2nd, 3rd, 5th, 6th and 7th (D, E, G, A, B in the above examples) to be individually adjusted, so arpeggios and sequences in all – well, almost all! – of these scales are possible. The double harmonic minor isn’t possible because Bigfoot can’t produce F# and G at the same time; but 7 out of 8 isn’t bad! 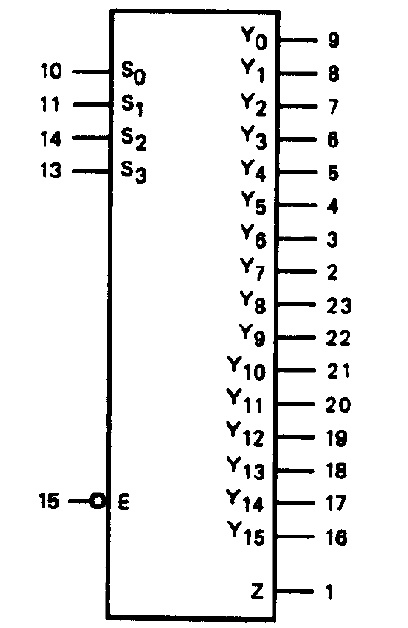 So, 16 individual intervals are available from the Bigfoot, spread over two octaves; the tonic is repeated 3 times, at 3 octaves; the 4th is repeated twice, at two different octaves; the other 10 notes are switchable between a ‘normal’ or ‘flattened’ version, which is semitone lower. Hang on, that’s only 15 intervals . . . Well, since all 16 Select input combinations from ‘0 0 0 0’ to ‘1 1 1 1’ could be used to produce notes, there might in some circumstances be no way of stopping the Stylophone from sounding; so what I did was to start with ‘0 0 0 1’ (the second output) and make that the lowest note, reserving ‘0 0 0 0’ (the first output) for a rest where no note would sound. I added a switch so that the first and second inputs could be connected together for those situations when this would be better. I also added a START/STOP switch, which is what pin 15 of the 4067 does: if connected to +v it stops, and all the switches are disconnected, regardless of the state of the Select inputs; if pin 15 is connected to 0v the switches start to work. (The 4051 also has this feature). In practice, I actually installed a second 4067, with the two 4067’s being connected only at the 4 Select inputs (pins 10, 11, 13 and 14). I wanted to have an LED indication of which switch was connected, and had to separate this function from the resistor chain that produced the notes. 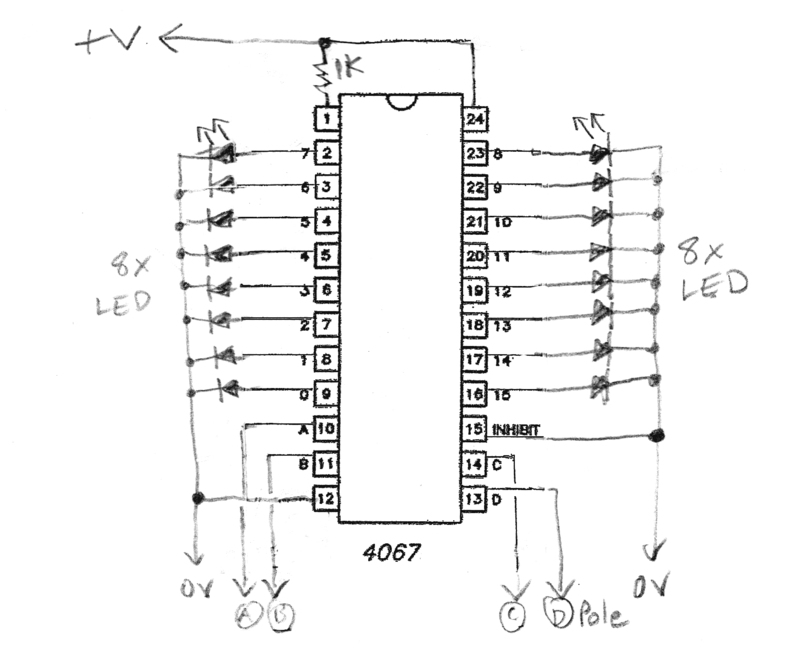 So the pole pin of the second 4067 was connected to +9v via two 1k resistors [not one, as shown in the diagram], and each of the 16 outputs was connected to a green LED (matching the green case the circuit was built into). In order to test the LEDs – and later to test the notes which were being produced – I needed some way of connecting exactly the right input/output to the pole of the switch, so I would know I was adjusting the right preset. This meant feeding exactly the right combination of +v (‘1’s) and 0v (‘0’s) to the Select inputs, to get exactly the right output. I considered four 2-way switches, +v one way, 0v the other way, and changing the notes by moving different switches up and down, as I described before – but it turns out there is a device which does this job very simply, just like turning a rotary switch: a 4 bit binary (sometimes called hex) rotary encoder. I wouldn’t say these are extremely easy to come by, but this is the one I got: http://uk.mouser.com/ProductDetail/Alpha-Taiwan/RE2001F-40E2-20F-4B/?qs=yA6kp8fx8Y4fjZ7sDt2l6A%3d%3d. 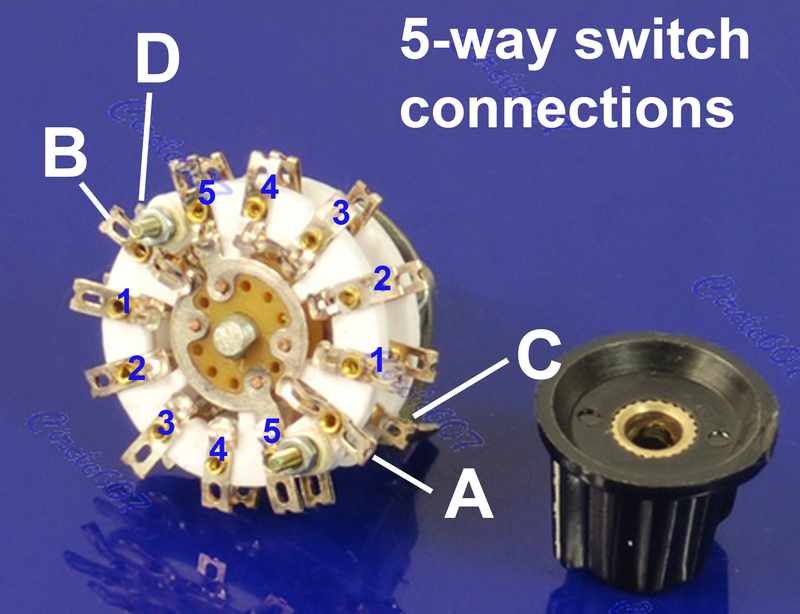 (The above picture shows a typical rotary encoder made by Alpha Electronics. RS online sell a couple, but looking at the product details, I don’t think the connections of the ‘Code 033’ version they sell is right. There are lots of 2 bit encoders, and lots of encoders which are not binary or hex. They won’t work – it has to be 4 bit binary with 16 positions, starting with ‘0 0 0 0’ at position 1 and stepping through the binary numbers 1 – 15, ending up at ‘1 1 1 1’ at position 16. These are referred to as ‘hex’ because the hexadecimal system has 16 numbers in it [usually written as ‘0 1 2 3 4 5 6 7 8 9 A B C D E F’ – a more user-friendly way of depicting ‘0 0 0 0’ to ‘1 1 1 1’]). I needed to use the encoder for another part of the circuit, which I’ll come to later, but for the time being its 4 outputs were connected directly to the 4 Select inputs, ‘A B C D’, of the 4067s. Its other connection, ‘Common’, was connected to + volts. To test it, I used 4 LEDs, and could see that turning it from position 1 to position 16, it automatically output the binary numbers in order from ‘0 0 0 0’ to ‘1 1 1 1’. The other thing about rotary encoders is that they don’t usually have a stop, they just go round and round. This is fairly useless if you need to know where ‘1’ is, or where ’16’ is, and this is the main reason why I decided to incorporate the LEDs as a visual indication. The other reason is that sequencers and so forth really ought to have flashing lights on them. 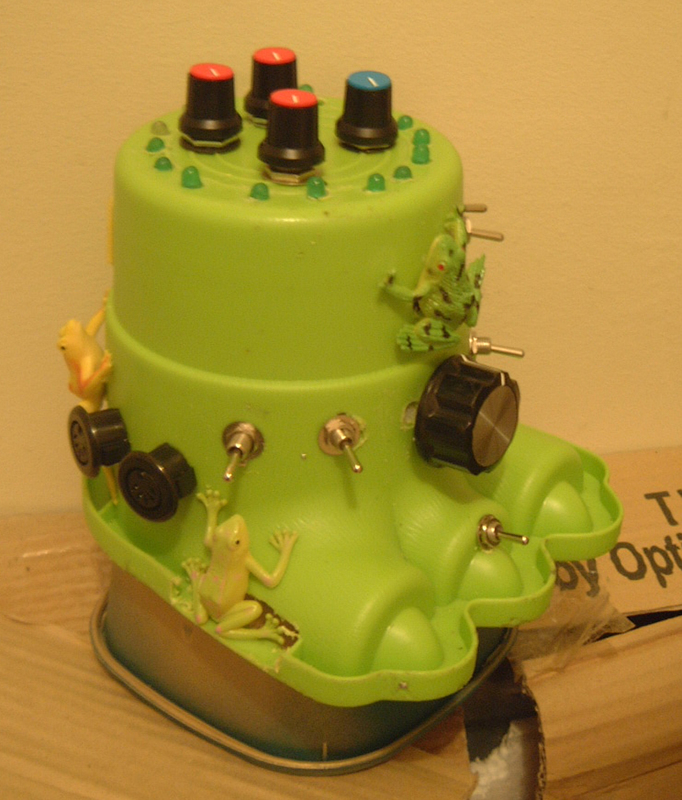 I glued the LEDs in place on the top and connected up the rotary switch. Sure enough, with each turn the LEDs lit up one by one, one at a time, and now it was possible to tell which was position 1, which was position 2, etc. Not only that, with the lack of a stop at 1 and 16 – which you would expect with a normal rotary switch – if nothing else I had Method 1 of controlling the Stylophone remotely: a manual method of arpeggiation by spinning the encoder backwards and forwards! . . .
. . . Entertaining, but not the automatic method I was looking for, however, so I moved on to Part 2 of the construction.